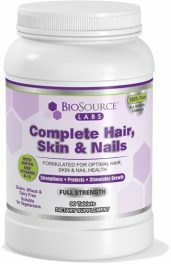 BioSource Labs Complete Hair Skin & Nails is a perfect blend of essential vitamin and minerals, specifically formulated for optimal hair, skin and nail health. During a low calorie diet phase, many dieters have trouble maintaining beautiful, robust, healthy hair. Our Complete formula provides fantastic nutritional support to help combat thinning hair, pale skin, and brittle nails that dieters may experience due to very low calorie intake. This product is the answer to help to give the extra “glow” many women and men look for in their appearance. To achieve the full benefits of this nutritional powerhouse, you’ll want to make sure you’re eating healthy and drinking plenty of water. Taking the Complete Hair, Skin & Nails consistently on a daily basis over time is the key to unlocking the full benefits of this powerful formula. Realize your potential beauty by making this a part of your daily supplement lineup. Complete Hair Skin & Nails is approved for use during the Complex Diet Drops protocol. Just like our Whole Food Multivitamin, this formula is particularly beneficial for people following a many different diets such as Complex Diet Drops Diet, keto diet, hCG diet, and the paleo diet. Including this into your daily health regimen will help keep your body and mane looking pristine. Whether you’re dieting or not, your body will still soak up the vitamins and minerals in Complete Hair, Skin & Nails, helping you fell amazing while gaining a more lustrous look. Dosage: 3 tablets daily with food. For optimum results and health benefits, you should consider taking Complete Hair Skin & Nails multivitamin in the morning with breakfast, in the afternoon with lunch and in the evening with supper. You may wish to avoid taking the vitamin without food to avoid the possibility of an upset stomach or feeling nauseous. It’s best to take with food. By taking it in the morning when you’re starting your day, you’ll have all the energy you need to put your best foot forward throughout the day. It’s safe to store the Complete Hair Skin & Nails multivitamin at room temperature when unopened. Once opened, store in your refrigerator to ensure freshness. Folic Acid: Commonly used to both prevent and treat low folate levels and insufficient nutrient absorption. Folic acid is also used to treat and prevent: heart disease, cancer, stroke, liver disease, kidney disease, ulcerative colitis, memory loss, hearing loss related to age, eye disease, weak bones, Alzheimer’s disease and more. Folic acid is great for hair, skin and nail health. Biotin: Biotin strengthens nails, improves hair health and is used to lower blood glucose levels. Iron: Sufficient iron is needed within the body for overall growth and development. Iron works to effectively metabolize the body’s much needed proteins while playing a key role in hemoglobin and red blood cell production. Vitamin E: Used to treat and prevent heart disease, high blood pressure, and many other disorders. Helps to strengthen hair, nails and improves skin health. A well-known anti-aging, remedy ingredient and anti-acne ingredient. Improves physical endurance and helps to increase energy naturally. Zinc: Keeps the immune system strong, helps heal wounds, and supports normal growth. Often used to fight infections, treat skin irritations, and heal acne, Zinc is an important mineral for hair, skin & nail health. Magnesium: A mineral that’s crucial to the body’s function. Magnesium helps keep inflimation down, bones strong, and the heart rhythm steady. Citrus Bio Complex: Contains some of the strongest flavonoid antioxidants, which help reduce inflammation, oxygenate tissue, and maintain normal blood pressure. This product is gluten, wheat and dairy free. Allergy sensative and suitable for vegetarians.